(l-r) Rep. Jack Lewis, Rep. David Linsky, Mayor Yvonne Spicer, US Senator Ed Markey, and Dr. Susan Blumenthal (Markey’s wife). 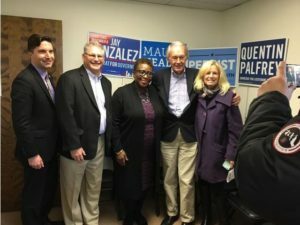 Norma Shulman reports: Senator Ed Markey and his wife Susan stopped by the Metrowest Campaign HQ to rally the volunteers for the last day before the Election. Mayor Yvonne Spicer, Representative David Linsky, and Representative Jack Lewis greeted the Senator and said a few words. There was a full house in the HQ meeting room! They even filmed a GOTV PSA to put online. There is Facebook LIVE video shared to the Framingham Democrats Facebook page. Posted in Archives on November 6, 2018 by Parwez Wahid.